Ideal Deal is the PUP that uses misleading techniques to prevent removal. Use Reimage to locate malicious components and get rid of them faster than with uninstall instructions. A full system scan blocks virus reappearance and prevents traffic to malicious domains. 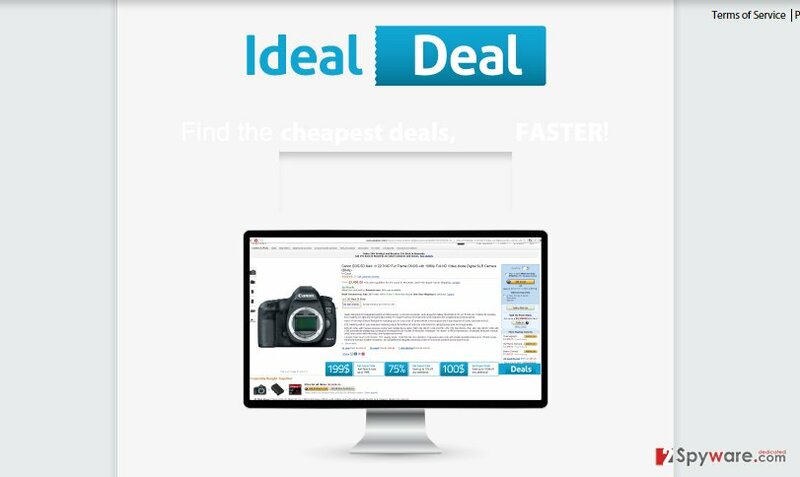 How can Ideal Deal hijack my computer? How to remove Ideal Deal virus? Besides, it is noted that your PC’s IP address, PC’s location, email address, name, telephone number, and similar data may also be collected if needed using certain technical modules (cookies, pixel tags, etc.). We believe that most of the users are not keen on being spied on, so we feel responsible for informing you about such Ideal Deal virus capabilities. On top of that, you should not fall for believing that this adware is going to save you time and money. Although it promises to present users with the best deals and discounts that should help with the savings, in reality such deals can hardly save you a dollar. In contrast, “Ads by Ideal Deal” may annoy you to deal and may sometimes trick you into visiting doubtful third party websites. Note that none of the Ideal Deal ads is powered by the developers of the add-on. Each of them is developers and managed by third parties who have an absolute freedom to promote whatever they want. Finally, this program may also ruin your browsing experience by slowing the system down and causing continuous crashes. Therefore, if you have already installed this add-on, set your anti-virus like, for instance, Reimage to remove Ideal Deal ASAP. Ideal Deal redirects to third-party websites may start happening as if out of nowhere. That’s because this app is usually spread in a bundle with various freewares and sharewares, so it may slither onto your computer without being noticed. Fortunately, it’s not difficult to prevent this from happening. Usually, optional downloads are hidden under Quick/Basic installation, so the in order to spot optional components (add-ons, plug-ins, toolbars, extensions), it’s a must to carefully check aforementioned settings and opt out of all unfamiliar tools that you find set by default. Of course, that may not necessarily help, but should at least try to avoid installation of potentially unwanted programs. Ideal Deal ads can trick you into visiting suspicious or even harmful websites. Therefore, if you have a slightest suspect that it may be hiding in the system, you should remove Ideal Deal virus either by yourself (using the steps below) or perform a full system check with a reputable anti-malware. Here, look for Ideal Deal or any other recently installed suspicious programs. Wait until you see Applications folder and look for Ideal Deal or any other suspicious programs on it. Now right click on every of such entries and select Move to Trash. When in the new window, check Delete personal settings and select Reset again to complete Ideal Deal removal. Once these steps are finished, Ideal Deal should be removed from your Microsoft Edge browser. Here, select Ideal Deal and other questionable plugins. Click Remove to delete these entries. Now you will see Reset Firefox to its default state message with Reset Firefox button. Click this button for several times and complete Ideal Deal removal. Here, select Ideal Deal and other malicious plugins and select trash icon to delete these entries. Click Reset to confirm this action and complete Ideal Deal removal. Here, select Extensions and look for Ideal Deal or other suspicious entries. Click on the Uninstall button to get rid each of them. Now you will see a detailed dialog window filled with reset options. All of those options are usually checked, but you can specify which of them you want to reset. Click the Reset button to complete Ideal Deal removal process. This entry was posted on 2015-09-23 at 02:35 and is filed under Adware, Viruses. You can quickly scan the QR code with your mobile device and have ads by Ideal Deal manual removal instructions right in your pocket. How did you remove Ideal Deal ads?